Sometimes this is called port trunking and may be called for something else too, but we will use bonding. But what is bonding? It's shortly making X number of NICs to work as one, with the purse of increasing the throughput (HT), increase the network availability (HA) or a combination of both. It's possible to use different brands and models of NICs, in a HA setup you can have different speeds (the bond will adapt to the slowest). Even if a NIC supports jumbo frames, it may not always work well in a bond together with jumbo frames. Before you begin with setting up your bond, check that all of the components used in your bond are working properly, for broken hardware and bad cables will be slightly more difficult to detect when you are setting up your bond for the first time. This example will include 3 servers, all using 3 NICs for their bond (The servers could have more NICs or/and bonds) and they have a RedHat like Linux which uses network-scripts to configure network settings. You have to decide if we want to use mii or arp monitoring of the "ports", mii is done locally and won't detect if something stopped to work remotely. Arp has the disadvantage that not all NIC drivers supports features needed for this to work. You also need to pick a mode how your bond should work, mode 0 - 3 should work with most switches, while mode 4 will require features you won't find in home switches and mode 5 - 6 will require that your NICs driver has ethtool support. You must specify between 1 and 16 ip-numbers, the more ip-numbers listed in the arp_ip_target the less risk that the "port" will be taken down when the remote machine reboots, all addresses is separated with a comma. Now you can restart the network service and you will have a new entry when you run ifconfig, the bond0, it will have the same MAC adress as eth1 and that applies also to eth2 and eth3. If you want to change the mode used, you need to unload the bonding module and change the setting and then load the module again, this can cause some problems if you do it remotely. If you decide to remove a NIC from the bond, either you take it down manually with ifconfig, or stop the network change the ifcfg-ethX file so that the NIC ain't part of the bond and then start the network again, if you change the file and then restart the network, you will still have the NIC as part of the bond. It's possible to assign the mode number or the mode name when selecting the mode in the kernel module option. This isn't something you are meant to do within your KVM guests, but on the host, you can assign the bridge to the bond instead of the traditional eth0, this way you will have HA, HT or HA/HT setup. Please let me know if you know a solution. 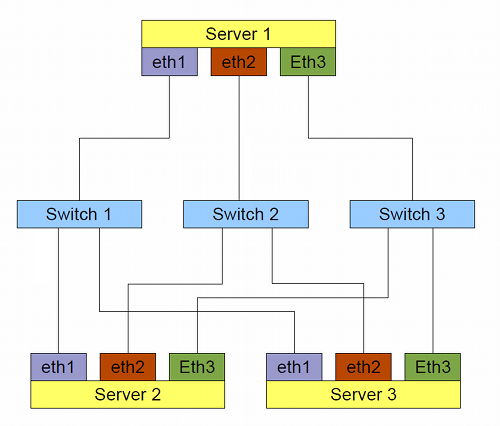 Here are some useful external links how to setup your bond for other Linux distributions and of course the more in detail Linux Ethernet Bonding Driver HOWTO, where you can read a bit of different examples of how to build your network with one switch (single point of failure).